Throughout my time as a gamer, I can appreciate new JRPG’s for what they offer the genre as a whole. Usually presenting stories that center around saving the world, along with including trope filled casts, there are many different elements that either endear you to this genre or push you away. 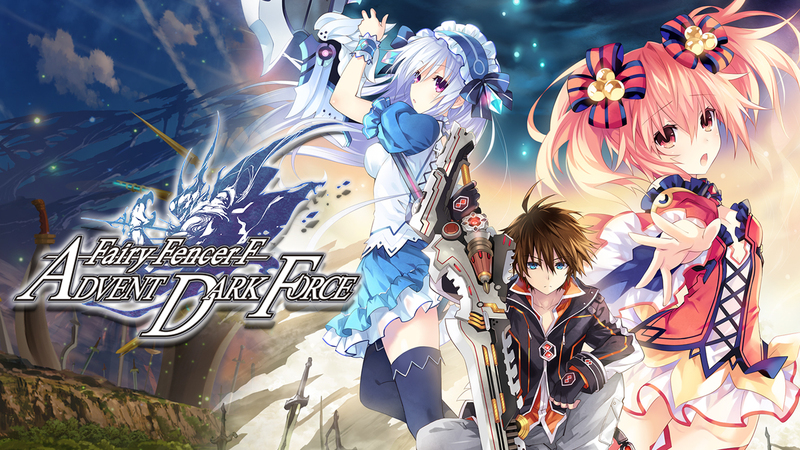 Fairy Fencer F: Advent Dark Force, from developer Compile Heart, is a remastered version of the 2013 RPG with enhanced graphics, additional story scenes, and extra endings. It may not push the envelope for the genre, but fans will still find a worthwhile gameplay experience. Fairy Fencer F introduces a world that was once a battleground for two deities known as the Evil God and Goddess. They fought using weapons they created called Furies which ended up sealing both of them away. However, some of the Furies still remained and people from around the world went seeking them out in order to use their power and turn themselves into fencers. After the story sets the stage, you are introduced Fang, a guy who is nothing special and pulls a sword out of a stone in hopes he gets something to eat. Instead, he ends up waking up a Fury named Eryn, turning himself into a fencer and reluctantly he agrees to go on a quest to gather Furies. Throughout your playthrough, new characters will join the party who bring unique and entertaining personalities. The story does well at balancing the fairly large cast and created an enjoyable story filled with plenty of comedic moments. There are times, however, when the proceedings get serious and the characters’ friendships and rivalries are tested making every story sequencing believable. Unfortunately, to get the whole story you will need to complete three endings which gives you access to other party members, who at one time, might have been your enemy. Usually these comedic RPG’s end up being overly obnoxious and annoying, but Fairy Fencer F managed to be entertaining and hilarious. Even the NPC conversations were often chuckle-worthy. It also helped the translation as the English dub was top-notch, but if you do prefer the Japanese dub, you can easily switch languages at any given time. The battle system features turn-based combat with some twists, such as the ability to enter Fairize mode and turn into a mech-like form with busted stats and skills. When you enter a dungeon, you can freely move around and initiate the battle by attacking the enemy. While the battles are turn-based, you can still move your character around the battlefield and this affects the range of attacks. Every character in your party feels unique with different attacks or support patterns with each character having special abilities and character specific skills at your disposal. There is a deep battle customization option that allows you to level up your characters and their weapons the way you want. Adding combos and attaching Furies as support are just one layer of the many customization options you can perform. You have the standard RPG fare such as equipment and items, but you can also assign individual elements and customize your attack combos, further enhancing your abilities with collectible Furies. Level design is nothing special, but I felt that the dungeons don’t overstay their welcome and they can be completed rather quickly. That being said, there is too much backtracking in these dungeons and that can make Fairy Fencer F feel very repetitive. Admittedly, the graphics and production values weren’t spectacular, but fortunately, loading times were short and character animations looked fluid. The orchestral music, though, was outstanding and there were some amazing tracks that added to the experience. Playing on the Switch is a great way to take this experience on the go, but there were a few issues that should be addressed. For one, I felt the dungeons lacked creativity in their aesthetics and oftentimes it was too dark to really get an understanding of where you needed to go. With no option to correct the darkness, it became somewhat difficult to navigate some of the more complex dungeons. Also, I experienced a few blatant framerate issues, particularly with heavy on-screen action. Fortunately, a day one patch did alleviate some of the more crippling framerate issues, but it still persisted enough to be annoying. Overall, Fairy Fencer F: Advent Dark Force has a great story to tell with multiple endings. There are some complex features to the gameplay, but it can be avoided if you want a more by-the-book JRPG. The difficulty can be adjusted if there is a particularly challenging battle, but for the most part are generally well balanced thanks to the creative customization system. The Switch version may not be the best place to play Fairy Fencer F, but it doesn’t take away from the fact that this is a game that all fans of niche JRPG’s will enjoy to play.